Worcester Royal Grammar School did not hold a prom ball for its fifth-formers after their O-level exams in July 1964. Instead we visited Archdales machine tool factory, the Co-Op milk bottling plant, the water works, the sewage works (complete with a 20 gauge Ruston) and Worcester Gasworks. We were taken to the top of one of the tallest buildings at the Gasworks and from there we looked down onto Worcester M.P.D. where the lowest-numbered production class 'A1', No.60114 'W. P. ALLEN' could be distinguished at the end of the dead lines. Two summers later I saw No.60145, the by-then nameless last survivor of that class, at Hull en route to Drapers scrapyard for its imminent demise. Now advance to 2011. 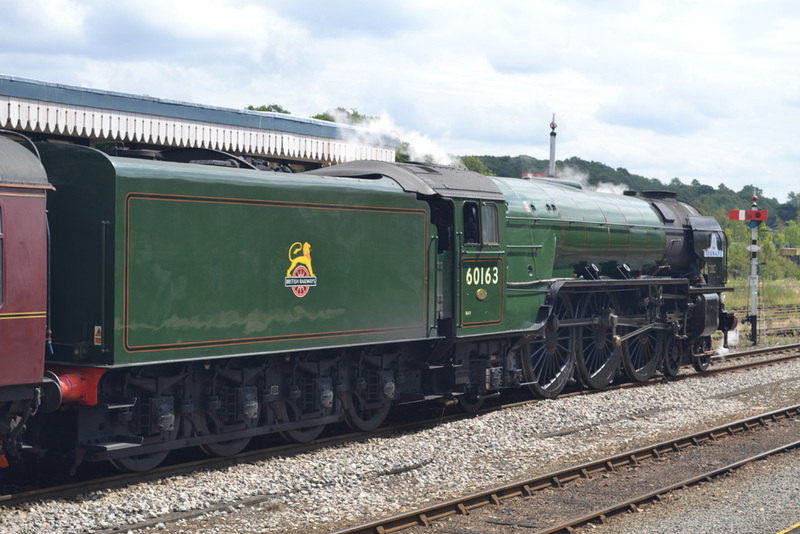 The timings for 'The Cathedrals Express' were not on the FMSLO answerphone when I went to bed the night before the special was due, but they were there in the morning. 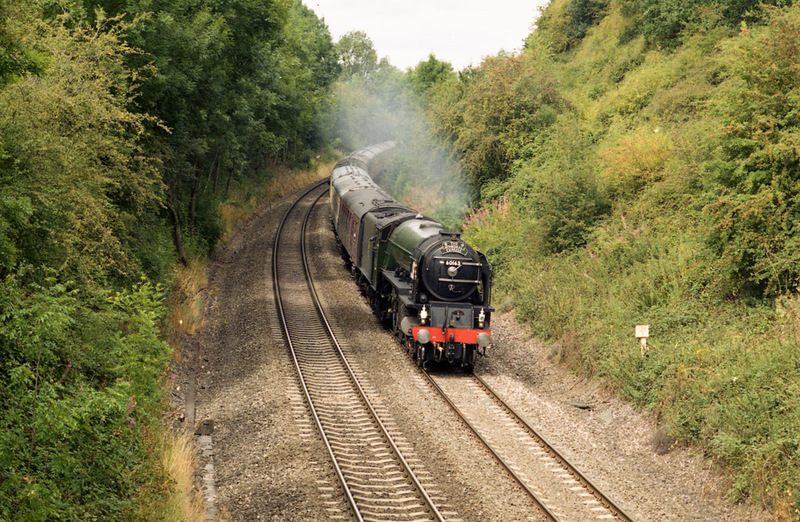 The 2008-built fiftieth 'A1' No.60163 'TORNADO' was due to visit Worcester between 13.23 and 17.36 on 6th August 2011. A gloomy sky suggested no problem with shadows, so I headed to Sneads Green (between Hartlebury and Droitwich) but I missed the first turning because, as I later discovered, the arm of the signpost had been rotated to an end-on position. Nevertheless I arrived in time for a good position on the bridge and I settled for an 85 mm photograph on colour negative film. Just as 'TORNADO' rounded the corner, a stray finger of sunshine appeared and threw a weak shadow across the foreground but not enough to matter. I also grabbed a going-away slide. Then I drove to Worcester, bagged the last time-unlimited, free, parking space in Shrub Hill Road and walked to the station. For some reason not known the locomotive was detached from its train at Platform 2 and then reversed through Platform 1 onto the line to Foregate Street. About fifteen minutes later No.60163 trundled back, light engine, past the bemused photographers, then changed its red tail tamps to white in an instant (they must be electric) and backed onto its stock exactly as it had arrived! Then the sun appeared properly. Soon after this the train made a false departure, stopped, and reversed past the other platform into the depot for servicing. 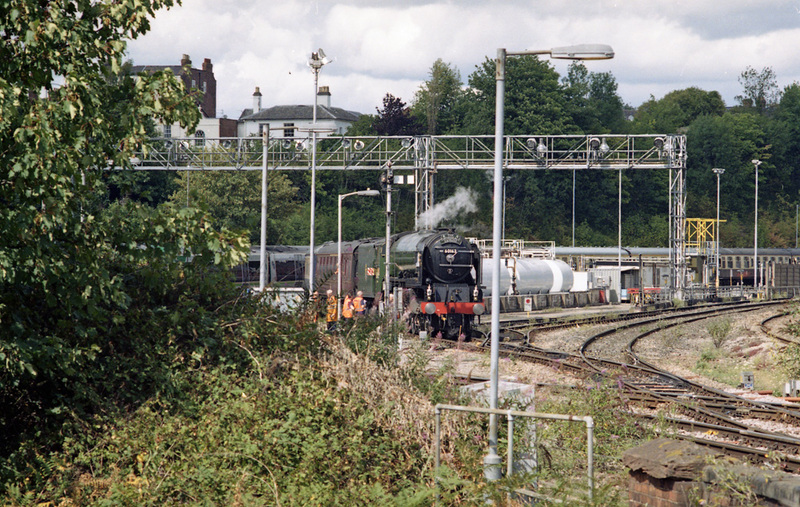 Photography was just possible with a 135 mm lens so I took another colour print and several slides showing No.60163 standing literally a clinkers throw from the adjacent tracks where No.60114 had stood forty-seven summers earlier. Then 60163 ran forward again with its support coach, so I took a good digital photo, before they disappeared round the corner to turn on the triangle. I walked back to my car with the distant chime whistle sounding over the rooftops, and at Malvern I took my film into Boots for one-hour processing. The results were satisfactory. Later class 66 diesel locomotive No.66135 arrived light engine from Bescot and was attached to the other end of the train. 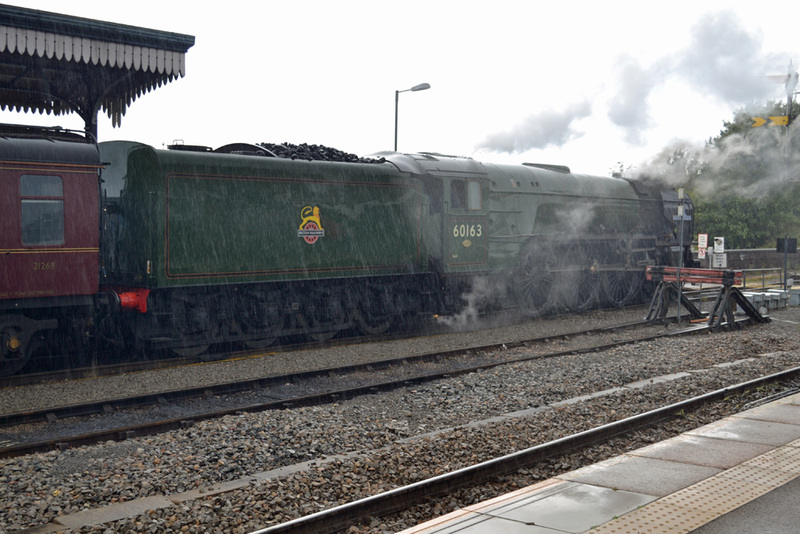 The train remained at the depot until after the 17:15 London Midland service from Worcester Shrub Hill to Dorridge had departed before the diesel locomotive drew the stock into the station. 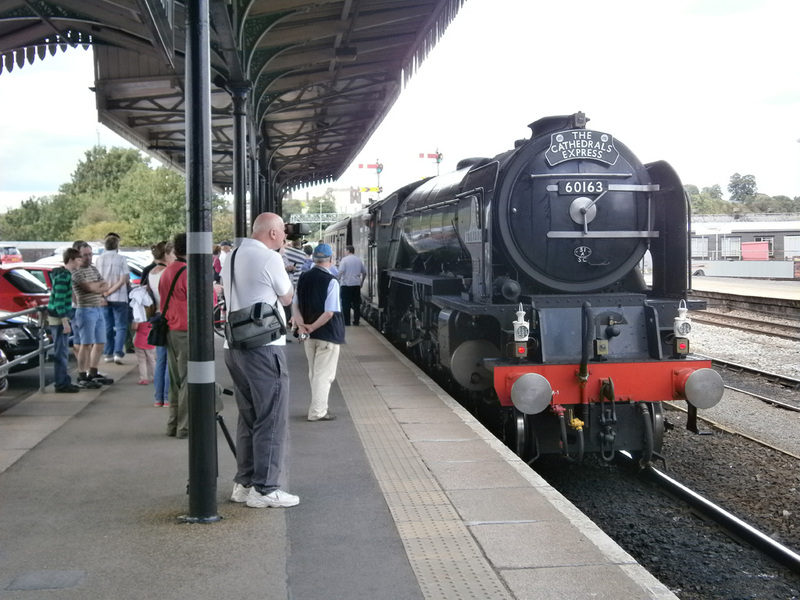 This manoeuvre presumably being necessary for the health and safety of the passengers on the railtour although no such action had been considered necessary when No.60163 had reversed the empty stock through the station. 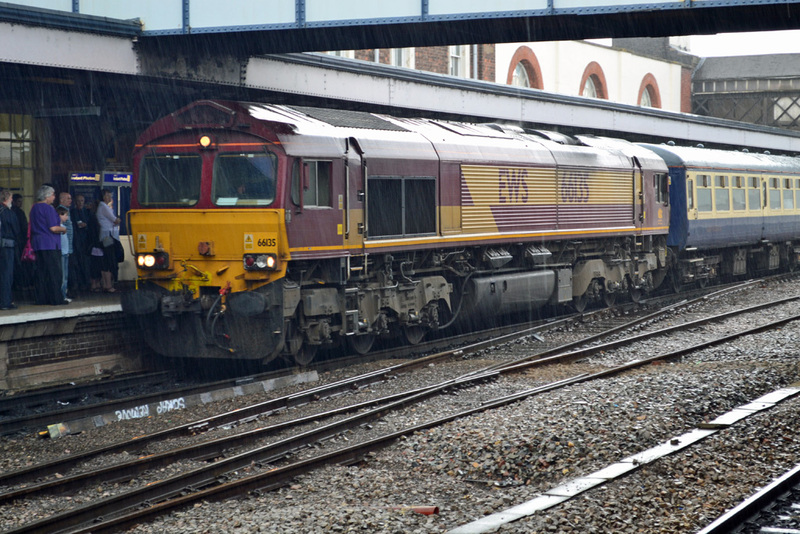 Meanwhile a heavy rainstorm had settled over Worcester which made for an atmospheric departure from Shrub Hill at 17:36. The rest of the grice was not satisfactory. I took my daughter to the infamous, soon to be closed, footpath across the line near the tunnel at Astwood and we saw several photographers blatantly trespassing - as photographed by my daughter. Nevertheless I obtained the last legal position. At this point the downpour started but I set my tripod and levelled the head ready to film the departure. The rain almost stopped and just as clag appeared in the distance, a London Midland diesel multiple unit crept past and stopped at the signal outside the tunnel to await the conflicting path. I started my video, but the image switched itself to widescreen and someones elbow appeared in the view. Video cannot be edited (in camera) so I stopped the camera, panned slightly and pressed the button to restart. Alas, there must be a minimum delay between sequences. I watched No.60163 sweep powerfully across the screen, let the last coach and trailing class 66 disappear, allowed a few more seconds of sound to elapse, and pressed the button to stop. What actually happened was that the camera finally restarted and filmed the diesel multiple unit disappearing into the tunnel while heads etc. bobbed around in the foreground until I finally retracted the lens. Of course I shall know better for the next northbound steam special. Its just a shame the footpath is likely to close before then! Photography by Robert Pritchard and Andrew Smith.